Guest blogger Bill Hayes, author of The Anatomist and the forthcoming Sweat: A History of Exercise, will present our 2014 Friends of the Rare Book Room Lecture, “Writing the Body,” on April 23 at 6pm. Register here. If I had excelled in the sciences in school, I might have gone on to become a doctor. But frankly, I didn’t even do well—I barely passed high school biology—whereas writing came easily. I followed that path instead. My interest in the body has led me to write about the science of sleep (my first book, Sleep Demons); the history of human blood (Five Quarts); and, in my last book, The Anatomist, the story behind the classic 19th-century anatomy text Gray’s Anatomy. For this, I spent a year studying anatomy alongside first-year medical students. I went from never having seen a cadaver to doing full cadaver dissection, trying to get a feel for what the original Henry Gray had done. After finishing the book, I had time on my hands and spent hours working out at a gym. I began running again; I went to yoga classes; I swam. I got into the best shape I’d ever been in. Exercise and I had had a long history by this point, yet the notion that exercise itself might have a history—that there could be such a thing—never occurred to me until one afternoon at the gym. I don’t recall the exact date but do know it was a cardio day, a cardiovascular workout, about six years ago. At the gym, I tend to go old school; the original StairMaster has long been my cardio machine of choice, both because it makes you sweat like nothing else and it gives you a certain psychological lift. Standing atop a StairMaster, one is a good four feet taller, allowing the illusion that you are Lord and Master of the Gym—like Sigourney Weaver when she mans the robotic killing machine in the second Aliens. You feel like you could conquer anything. Santorius weighing himself for a metabolism experiment after eating a meal. 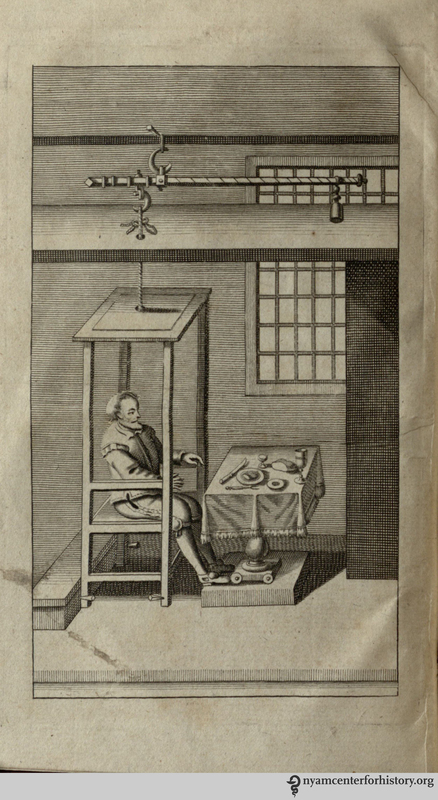 From Medicina statica: being the aphorisms of Sanctorius, 1720. Click to enlarge. I climbed up and punched in my usual program—Fat Burner, Level 15, 25 minutes. I arranged my towel and bottle of water, and thumbed in my iPod earphones. My finger found the machine’s START button, that small green circle, so powerfully endowed; each time you press it is a chance to wipe the slate clean and absolve yourself of somatic sins. Yet for some reason, I hesitated a moment on this particular day. I took in the scene before me—men and women of all ages and races, lifting weights, back-bending over giant rubber balls, fitting themselves into torturous-looking apparatuses, pulling themselves up on chin-up bars, dutifully doing sit-ups—and a thought popped into in my head: How did we all end up here? If one were to trace a line backward in time, where would one land? I stood there and thought about this for a long while then pressed clear, took up my towel and water and climbed back down. What I did next was pure reflex: I went to the library. Little did I know at the time: the journey to write my next book, a history of exercise titled Sweat, had started. This entry was posted in Events, History of medicine and tagged anatomy, Bill Hayes, exercise, guest post, history of exercise by nyamhistorymed. Bookmark the permalink. I thoroughly enjoyed reading this post. Thank you. You’ve now done books on blood and sweat. Would “tears” be next? Hello! 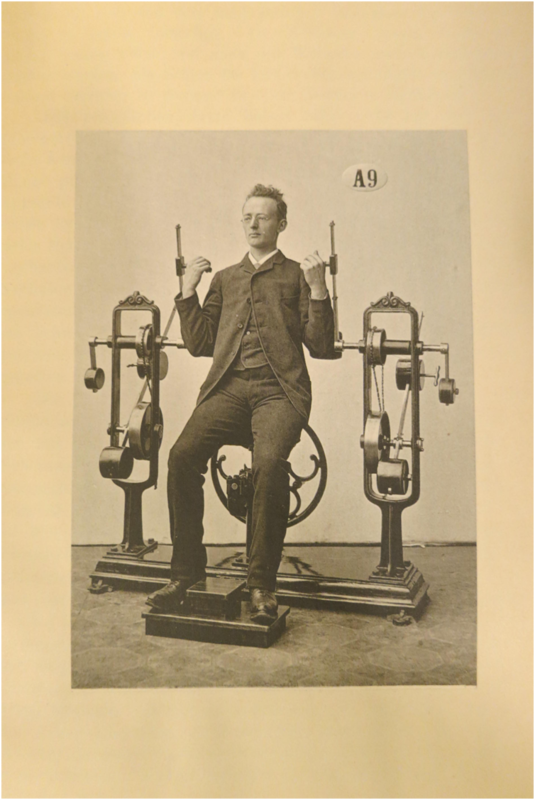 How can I get in touch with your “substantial collection on the history of exercise”? Hello! Please email us at library [at] nyam.org with what you’re looking for – particular types of exercise, certain time periods, etc., and one of our librarians will help you. Our library is open to the public by appointment.